We’re celebrating Family at 103.1FM and we’re inviting you to join in! 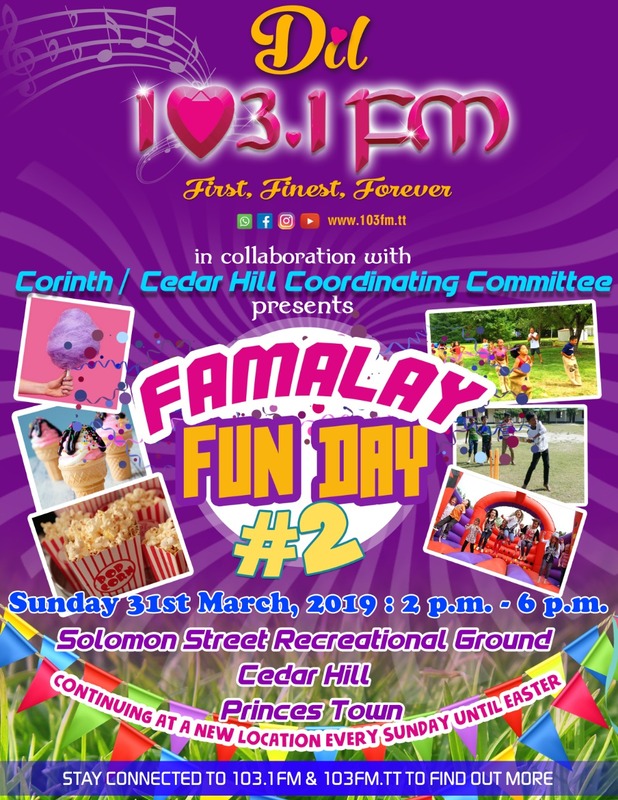 Our second ‘Famalay Fun Day’ in collaboration with the Corinth/Cedar Hill Coordinating Committee, takes place at the Solomon Street Recreational Ground, Cedar Hill, Princes Town on Sunday March 31st from 2pm to 6pm. We’ve got activities for kids and adults! Our Kids’ Zone has got bouncy castles, chair planes, pony rides and games like the Cadbury Great Egg-Scape Treasure Hunt, ring toss, punch board & the Sunshine Cereals Tug-O-War! Don’t forget to check our Health Zone to make sure you’re in tip top shape. Food & Drink will be on sale…and you’ll even get samples from our sponsors! Also, you can take part in the Mario’s Pizza Eating Competition! Round 2 of the 103FM and Chatak Foods Pepper Eating Competition also happens on the day! The all new 103FM Famalay Fun Day…on a Sunday…bring the family for an afternoon of fun! 1. THE PIZZA KING, MARIO’S…JUST THE WAY YOU LIKE IT.